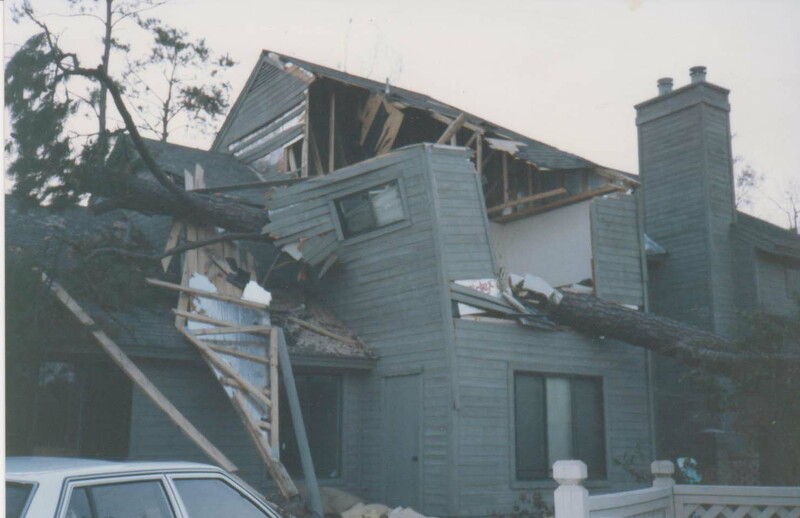 On Sept. 21-22, 1989, Hurricane Hugo — a Category 4 storm with 135 mph sustained winds — devastated Charleston, S.C., and my family lost everything. We lived a block from the beach in an inexpensive three-room apartment at ground level on Sullivan’s Island, after our move from “up North” about four years earlier. When the hurricane was predicted to make landfall nearby and the call for evacuation occurred, my ex-husband J, my 18-month old son M and I evacuated to Columbia, S.C., along with J’s parents and sister, who had been visiting. My ex was convinced the whole evacuation was unnecessary, so he chained his expensive Harley Davidson to a column in the house and we packed one of our two cars with a few suitcases and things we thought we’d need for an overnight trip away from home, not giving much thought to it. I was primarily concerned with bringing clothes and toys for the baby, filling the car with them. I brought only three pairs of shorts and three shirts for myself (it was still 90 degrees in late September). We left plenty of food and water for our two beloved cats — above floor level, although we really thought that was overkill — because we didn’t think we could take them to a hotel. Right before we left, the landlord called and told us to “roll up a towel” and put it at the bottom of the door facing the ocean. The three of us, plus the three visiting relatives drove to Columbia, S.C., about 90 miles from home. Due to the influx of evacuees, we could only find one vacant motel room and the six of us shared a cozy and sleepless night together in it. Hugo actually moved inland after devastating the coast near Charleston and caused severe damage and power outages in parts of Columbia (away from where we were, fortunately) during the night. 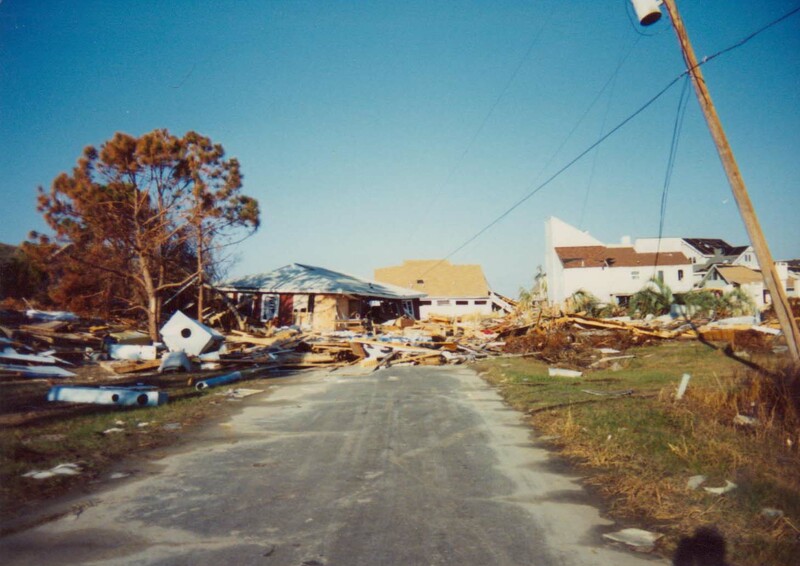 Since there was no power in and around Charleston, most people had evacuated, and the roads into town were filled with debris and impassable, the only word we got about what had happened at home was TV and newspaper reports. 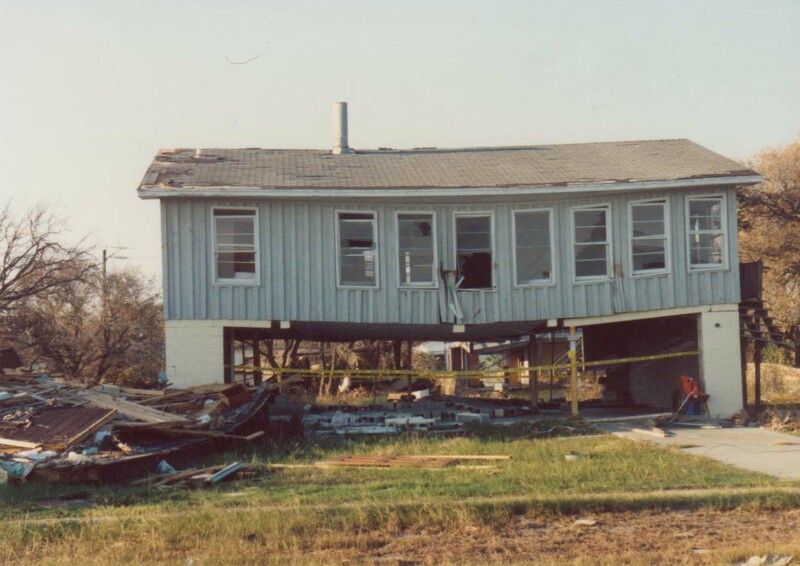 One radio announcer said all of Sullivan’s Island was under water, and a newspaper article showed a picture of our street, with only foundations left where some houses used to be and other houses blown out into the middle of the street. But the photo ended right before our house! It was scary and frustrating not to know if we had a home to return to. My son and I went to another state to stay in my parent’s vacant condo, and my ex, who’s a medical professional, went back to work, staying at a friend’s house. M and I ended up alone and out of town for more than a month — because water and power weren’t restored in Charleston for weeks. Authorities allowed residents back on Sullivan’s Island for the first time two weeks after the storm, since the only bridge to the island from the mainland was heavily damaged and unusable. J and I went by ferry with other shell-shocked residents and had to walk a mile to our house. We each carried a large plastic garbage bag, all we were allowed to fill and bring back that day. We were shocked to see destruction and devastation everywhere. Most of the houses were completely gone or heavily damaged. When we got to our driveway, the house was still there, but my underwear (which had been in my dresser) was hanging from the top of the tree in the front yard, and part of my best suit was caught in the rose bush. When we went inside, the apartment was a wreck. Walls were bowed, the glass in the windows was gone and the door facing the ocean had blown completely off. The back wall of the apartment had a gaping hole about 10 feet wide, that we walked through.The refrigerator, washer, dryer, stove, bookcases, dressers, and crib were all knocked over. A wall of water had swept through the house and everything was soaked; many things were mildewy. There was mud on the floor. It had rained several days since the hurricane, too, so that water had also soaked everything. 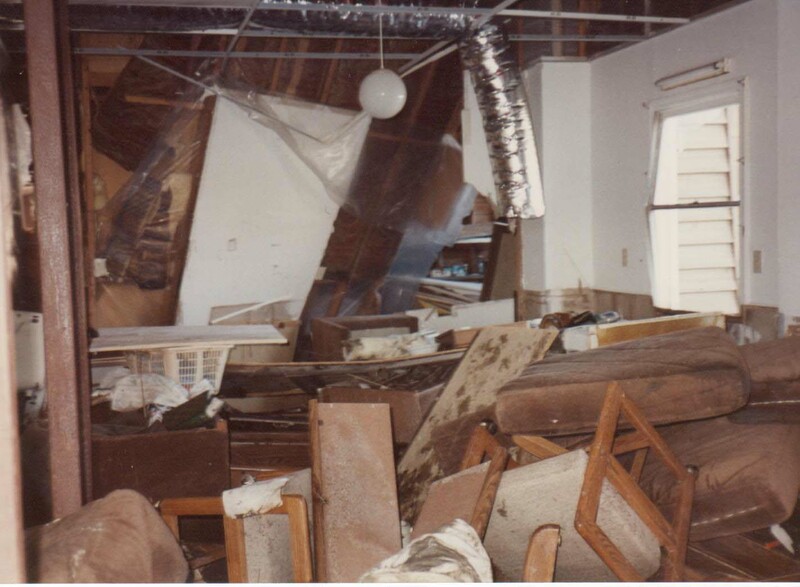 We had to climb over huge piles of debris; every piece of furniture in the house was broken. The blades were ripped off the ceiling fans and the tiles were gone from the ceiling, leaving exposed ventilation ducts. Our king sized bed with brass headboard and foot board had been moved across the bedroom and turned completely around. The double dresser and lingerie dresser were knocked over. The wall mirror was on the floor, shattered. The doors were blown off both bedroom closets and clothes were scattered in the yard, in the garage or in other rooms. Some shirts from J’s closet had blown in to the next room to my closet (still on hangers!) Nearly all the remaining clothes had rust stains on them. The file cabinet had been overturned, but our records were there, soaked. The only places relatively untouched were the top shelves of both bedroom closets. J’s new tennis shoes (six pairs) had been there, and five pairs were still in boxes (undamaged); the shoes from the other pair were in the yard and the house. M’s baby mementos (first lock of hair, etc.) were in the upper closet, and were in perfect condition. The kitchen counter was broken into pieces and scattered. However, most of our Corelle dishes that were inside the cabinet were unbroken. A wine glass was intact as were lots of mugs. M’s crib was broken and on its side but the mattress had blown out of his bedroom door and around the corner into the main room of the house. We found the body of our 14 year old cat, Whiskers, who had apparently drowned. The 13 year old cat was gone. Basically, everything we’d accumulated in 15 years of marriage was destroyed. See the conclusion in tomorrow’s blog post… and more photos of the destruction in our neighborhood below. 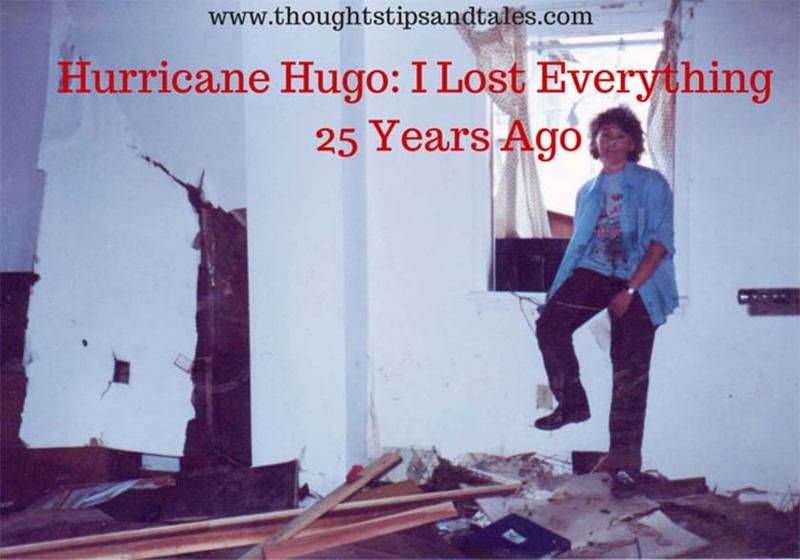 This entry was posted in hurricane, hurricane hugo, thoughts tips and tales and tagged hurricane, hurricane hugo, losing everything, thoughtstipsandtales. Bookmark the permalink. Ahh memories. As I looked at these photos I could almost smell that sickening Hugo smell. 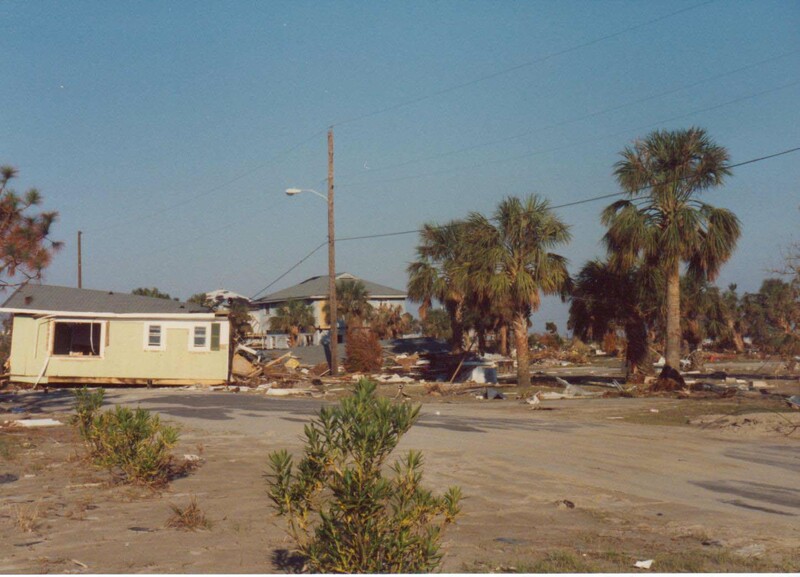 The yellow house in the middle of the street (your third picture) is what kept my house (the one to the right of it) from washing away. It was a crazy time. whoa. that’s devastating. i cannot imagine what its like to lose everything you own (material things). 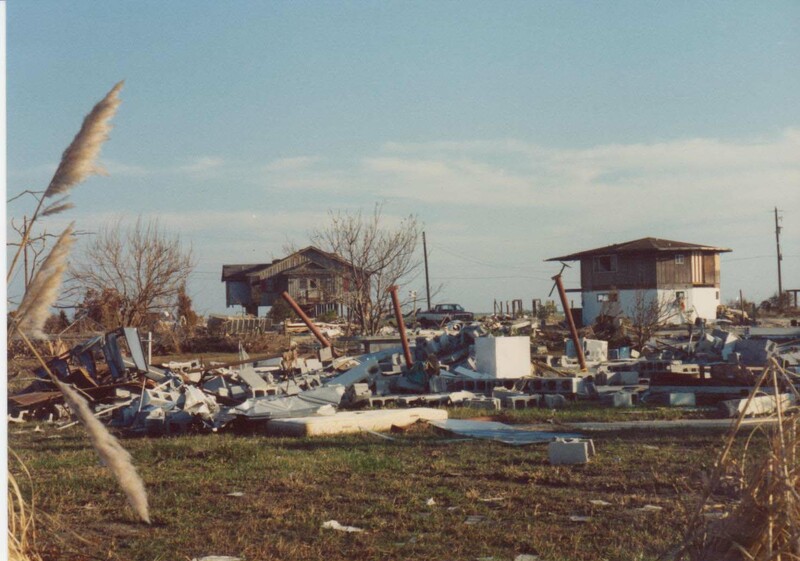 my husband lost most his belongings after hurricane katrina. after he returned to NOLA to revisit his place, a security guard told him how he had lost family members in the flood. saddening and humbling, it really puts things in perspective. Horrible to lose so many things, although it sounds as if some of your truly important mementos survived. You’re right – the photos were the most important. And for some unknown reason, I’d put the negatives from my son’s first year in my safe deposit box before Hugo — that was lucky! Going through a hurricane helps you find out in a hurry which things are really important!